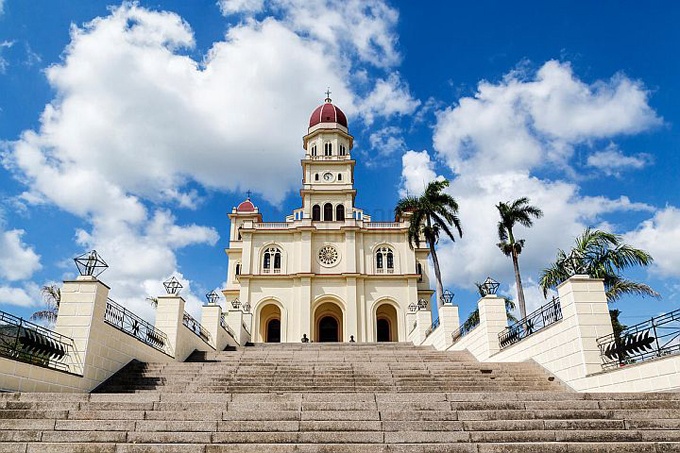 It was built in 1926 in the village of El Cobre about 12 miles west of Santiago de Cuba. 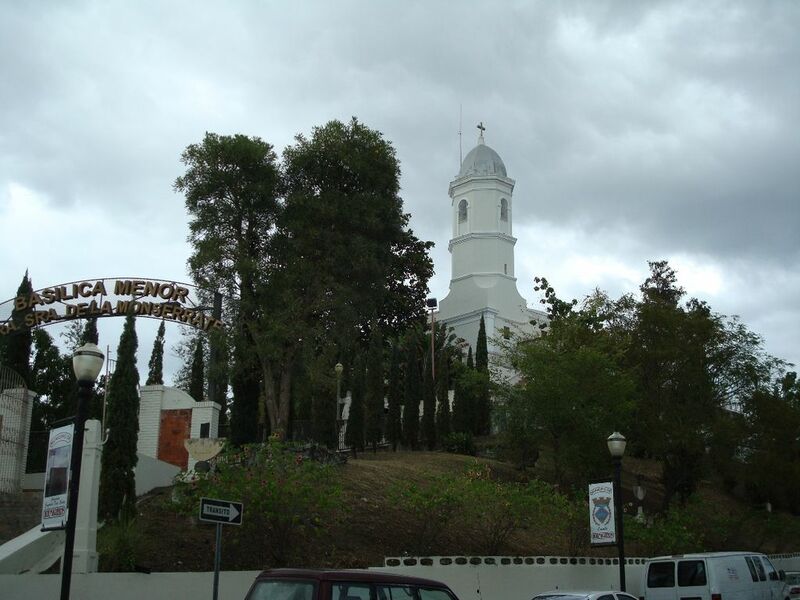 It is a 3 aisled church on the hill “Cerro de la Cantera” and is linked to the village by a flight of 254 steps. It has a central bell tower and two side towers crowned by red-brick domes. Our Lady of Charity also known as Our Lady of El Cobre or Nuestra Senora de la Caridad del Cobre or “la Virgen de la Caridad” is a popular Marian title of the Blessed Virgin Mary known in many Catholic countries. 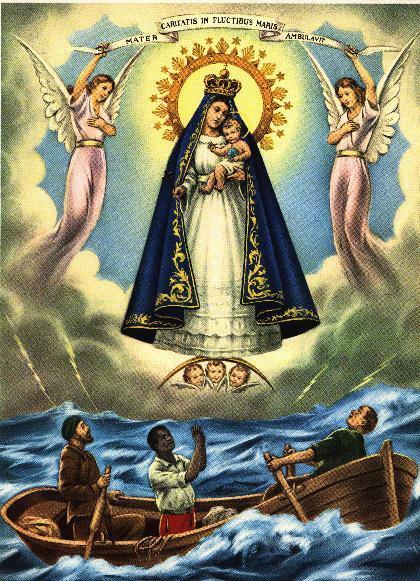 Several known Marian images with the same title exist around the world while a particular Hispanic image is pontifically designated by Pope Benedict XV as the Patroness of Cuba. 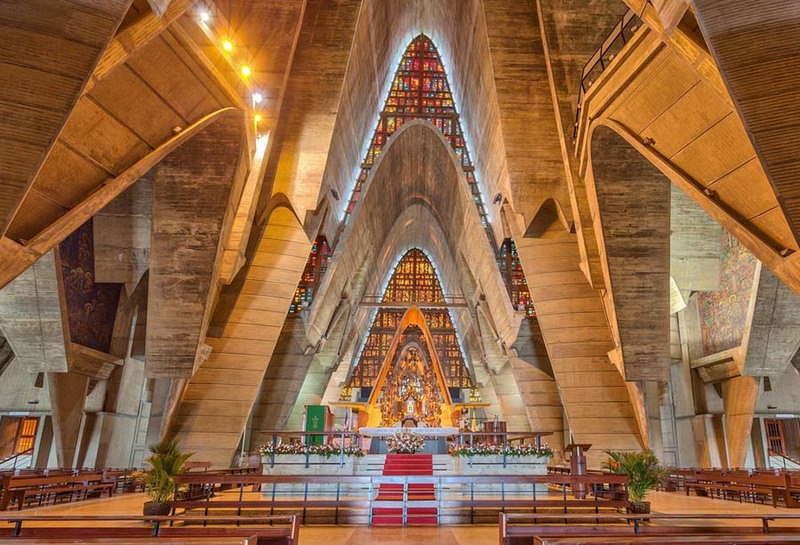 The present image is enshrined in the National Shrine Basilica of Our Lady of Charity of El Cobre, built in 1926 and situated in the village El Cobre, near Santiago de Cuba. Pope Pius XI granted a Canonical Coronation for the image on 20 December 1936. The feast day of Our Lady of Charity is September 8; the solemn Nativity of the Blessed Virgin Mary. 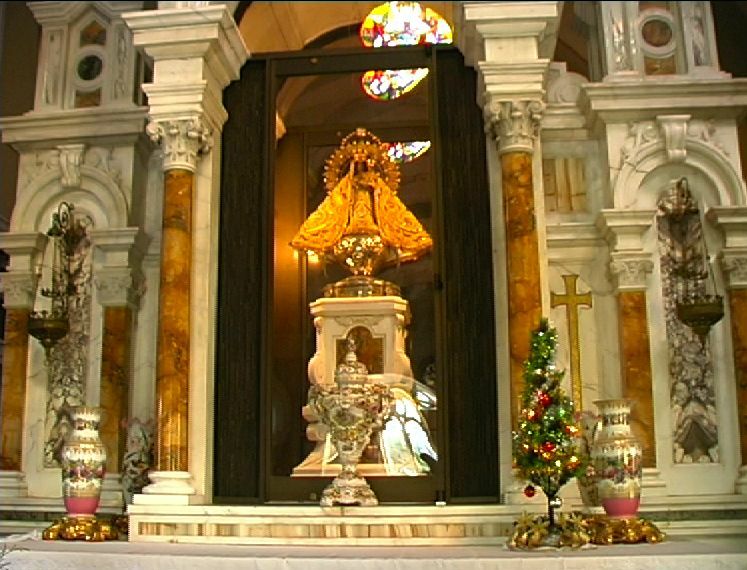 The history of the La Virgen de la Caridad del Cobre, began around 1612. 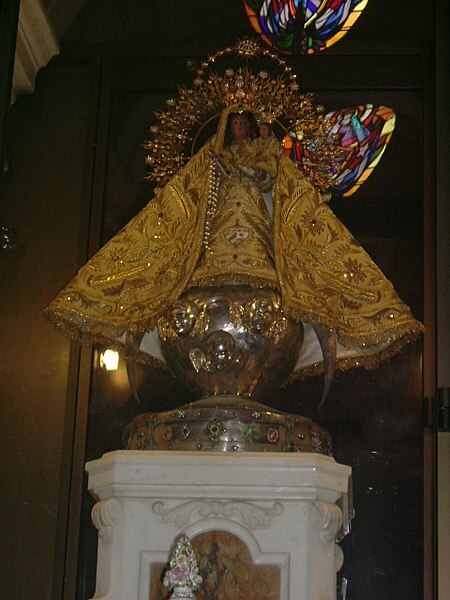 The image is thought to have been brought by Spaniard colonists from the town of Illescas, a province in Toledo, Spain where a similar statue of the Virgin Mary of Charity was already well-venerated. Local legend recalls the Spanish captains who bring with them religious Marian images to guide and protect them from English pirates at sea. Two Native American or Indian brothers, Rodrigo and Juan de Hoyos, and an African slave child, Juan Moreno, set out to the Bay of Nipe for salt. They are traditionally given the moniker the “three Juans”. They needed the salt for the preservation of the meat at the Barajagua slaughter house, which supplied the workers and inhabitants of Santiago del Prado, now known as El Cobre. While out in the bay, a storm arose, rocking their tiny boat violently with incoming waves. Juan, the child, was wearing a medal with the image of the Virgin Mary. The three men began to pray for her protection. Suddenly, the skies cleared, and the storm was gone. In the distance, they saw a strange object floating in the water. They rowed towards it as the waves carried it to them. At first they mistook it for a bird, but quickly saw that it was what seemed to be a statue of a girl. 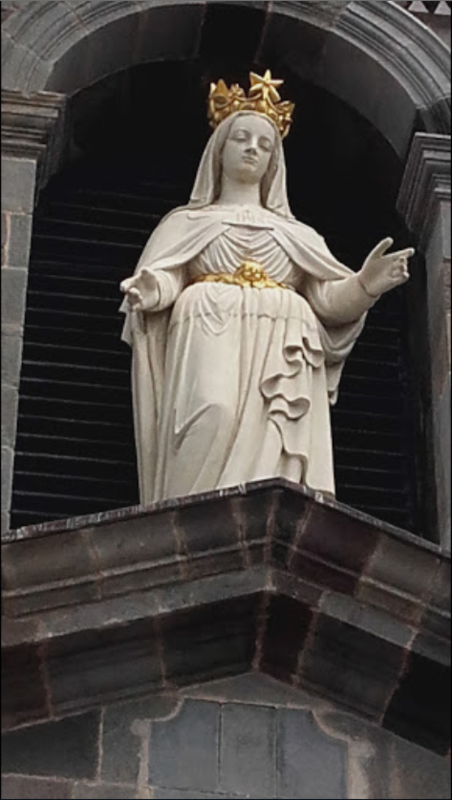 At last they were able to determine that it was a statue of the Virgin Mary holding the child Jesus on her left arm and a gold cross in her right hand. The statue was fastened to a board with an inscription saying “Yo Soy la Virgen de la Caridad” or “I am the Virgin of Charity.” Much to their surprise, the statue remained completely dry while afloat in the water. Overjoyed by what they had discovered, they hurried back to Barajagua. They showed the statue to a government official, Don Francisco Sánchez de Moya, who then ordered a small chapel to be built in her honor. One night, Rodrigo went to visit the statue, but discovered that the image was gone. He organized a search party, but had no success in finding Our Lady of Charity. Then, the next morning, she was back on the altar, as if nothing had happened. This was inconceivable as the chapel had been locked. This event happened three times. The people of Barajagua came to the conclusion that she wanted to be in a different spot, so they took her to El Cobre. She was received with much joy in El Cobre, and the church there had its bells ring on her arrival. 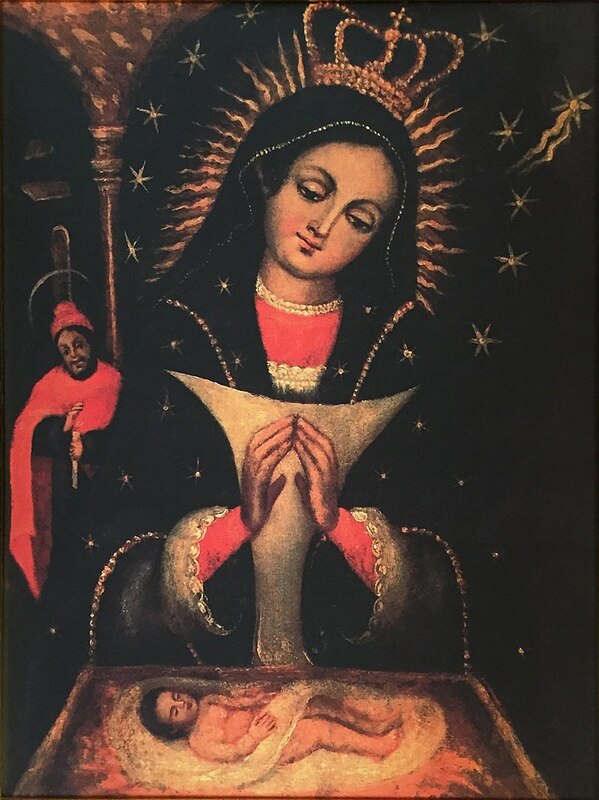 It was at this point that she became known as “Nuestra Señora de la Caridad del Cobre” or “Our Lady of Charity of El Cobre”. Much to the dismay of people in El Cobre, the disappearance of the statue continued to happen. One day, a young girl named Jabba was playing outside, pursuing butterflies and picking flowers. She went towards the mountains of the Sierra Maestra, where she came across the statue on top of a small hill. There were those who did and those who did not believe the little girl’s testimony, but in the end, the Virgin was taken to the spot of her discovery, where a church was erected for her. Before the famous image on 19 May 1801, a royal edict from king Charles IV of Spain decreed that Cuban slaves were to be freed from the El Cobre copper mines. The story circulated around the island quickly. 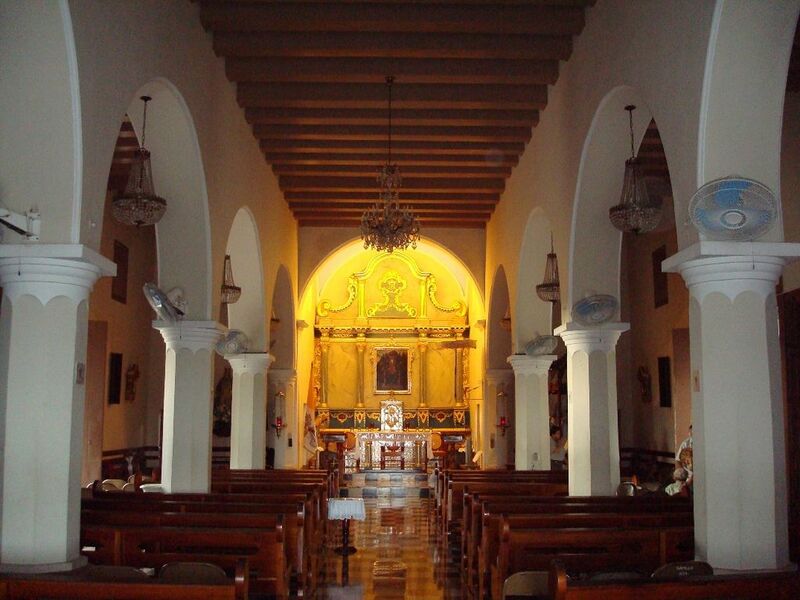 Many felt that the Virgin purposely chose to have her sanctuary in El Cobre because it is located in Oriente Province. Later folk legends associated the taking of copper materials to their homes after having it blessed near the Virgin’s sanctified image as a form of souvenir and miraculous healing. The Cuban statue venerated measures about 16 inches tall; the head is made of baked clay covered with a polished coat of fine white powder. Her feet rest on a brilliant moon, while angels spread their golden wings on a silver cloud. The child Jesus raises his right hand as in a blessing, and in his left hand he holds a golden globe. A popular image of Our Lady of Charity includes a banner above her head with the Latin phrase “Mater Caritatis Fluctibus Maris Ambulavit” (Mother of Charity who walked on the road of stormy seas). Originally, the robes on the image were white in color. Newer robes are embroidered with gold and silver, which includes the national shield of Cuba. 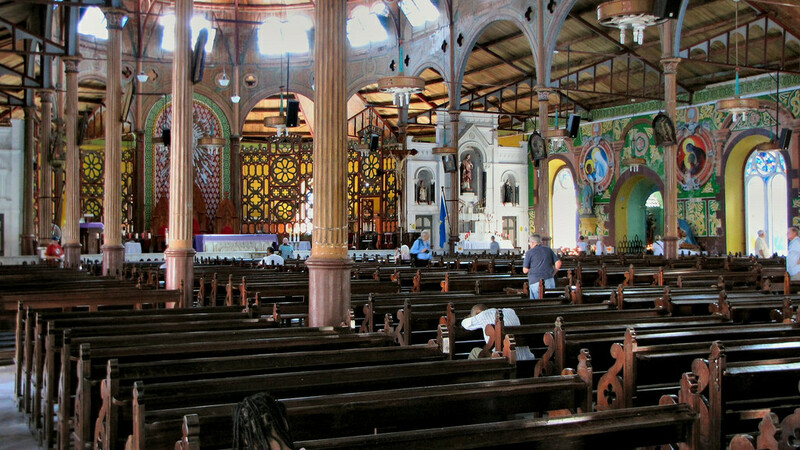 Among Cuban religious devotees, the image is given the familiar title of La Cachita. 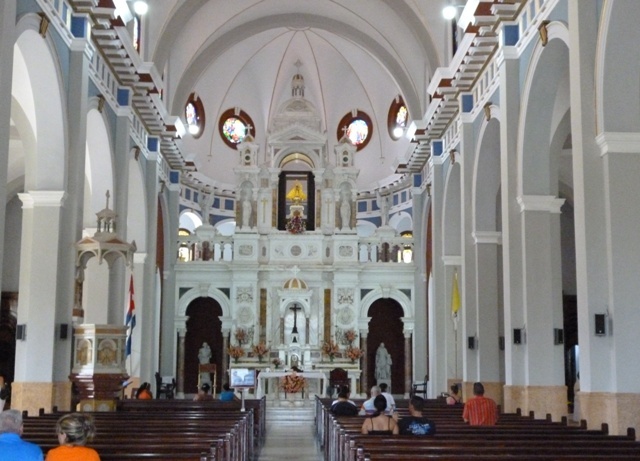 functions as Catholic Minor Basilica and at the same time as co-cathedral of the Diocese of Willemstad (Latin: Dioecesis Gulielmopolitana) on the island of Curacao in the Caribbean Sea off the coast of Venezuela. The other being the main cathedral dedicated to Our Lady the Queen of the Holy Rosary of the same city. dedicated to Our Lady of Altagracia, patroness of the nation. It is in Salvaleón de Higüey. 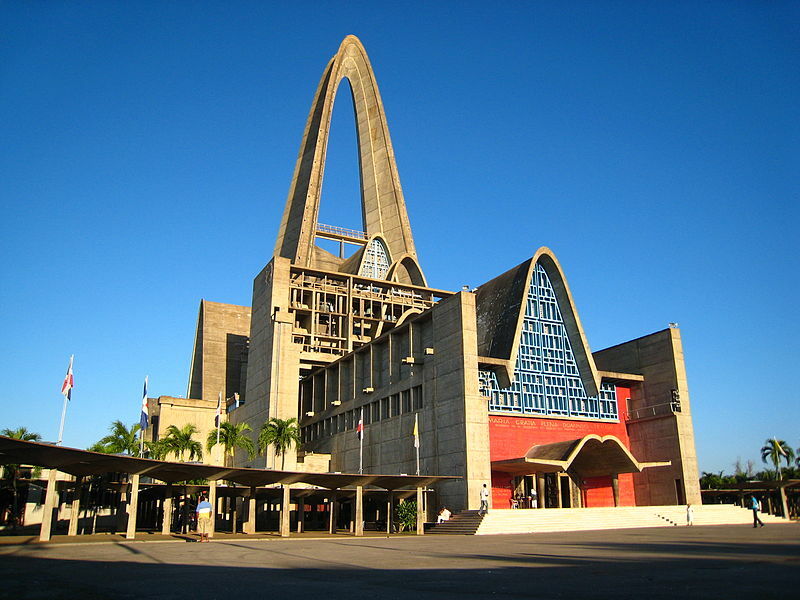 The basilica is the seat of the Roman Catholic Diocese of Nuestra Señora de la Altagracia en Higüey. Among the many reasons that inspired its creation, there is one that stands out. A long time ago a young girl from same city asked her father for a portrait of the Virgin Mary. Her father (name unknown) brought the picture as gift for her. It is believed that the portrait was placed at the house of this girl. For some reason, at the break of dawn of each day, the portrait was always found outside the house, beneath a small tree. Every day this portrait was moved back inside by the girl, until she told her parents about it. The place became sacred, and the basilica was built on that same spot as reference of Mary’s grace. 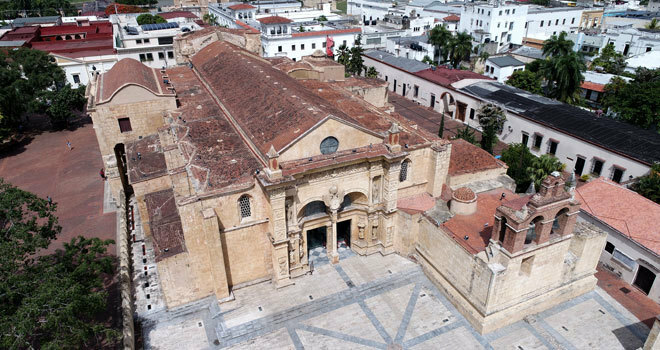 The Cathedral of Santo Domingo is the oldest in America, built by mandate of Pope Julius II in 1504. 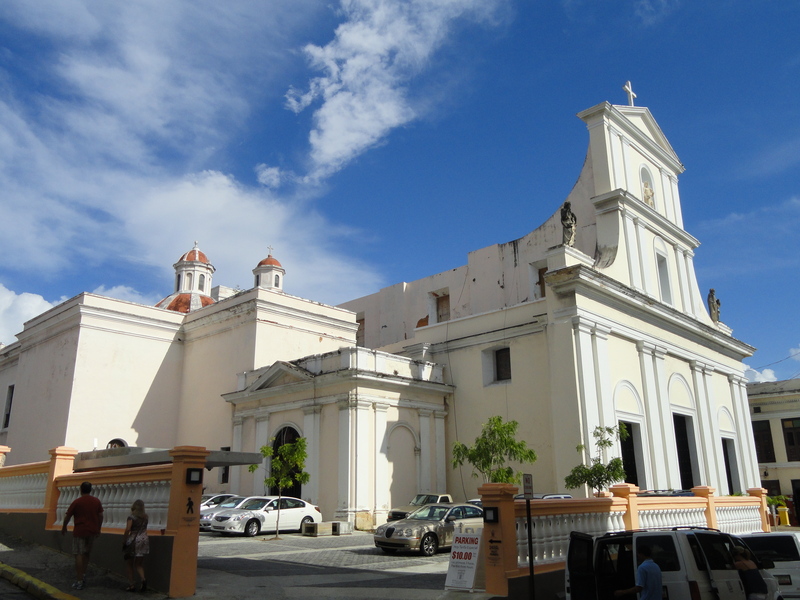 Seat of the Archdiocese of Santo Domingo, its construction began in 1512, under the pastoral care of the first bishop of Santo Domingo, Fray García Padilla , who never came to the island; on the basis of plans by the architect Alonso de Rodríguez. Once the works stopped, they continued with a new design by Luis de Moya and Rodrigo de Liendo in 1522 with the intervention of Bishop Alejandro Geraldini. The architect Alonso González, inspired by the Cathedral of Seville, partially completed the church in 1540. Subsequently Alonso de Fuenmayor, promoted the works and on August 31 of the year 1541 was consecrated. In 1546 Pope Paul III, raised it to the rank of Metropolitan Cathedral and Primate of America at the request of King Charles I of Spain. Another promotion came in 1920 when Pope Benedict XV elevated it to “Minor Basilica of the Virgin of the Annunciation”. In the second half of the 16th century, on the south side the Claustro sector was built, with the cells of the canonical ones; Another example is found in the Cathedral of Salamanca in Spain. In 1547 the works of the bell tower were interrupted, because its height surpassing the Tower of the Homage, had given disturbances to the sentinels. It was headquarters of the troops of Sir Francis Drake during his invasion of 1586, who sacked it. Apparently in 1665 there was a second consecration. Initially without chapels, in 1740 it had 9 and currently it has 14. The chapels of Alonso de Suazo, Rodrígo, Bastidas, Geraldini and Diego Caballero deserve special mention, as well as the crypt of the Archbishops and the lateral Baptismal chapel . Among the works, the painting of N. S. de la Antigua, donated by the Admiral. The organ was taken to Magdeburg in 1850. 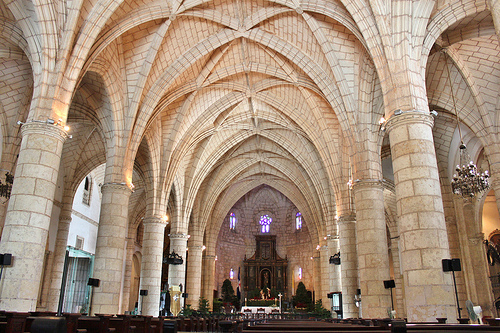 The architecture of the Santo Domingo Cathedral building is characterized by a Gothic style with ribbed vaults, solid walls and three doors, two of which are Gothic in contrast to the third and main one in Plateresque Gothic style. 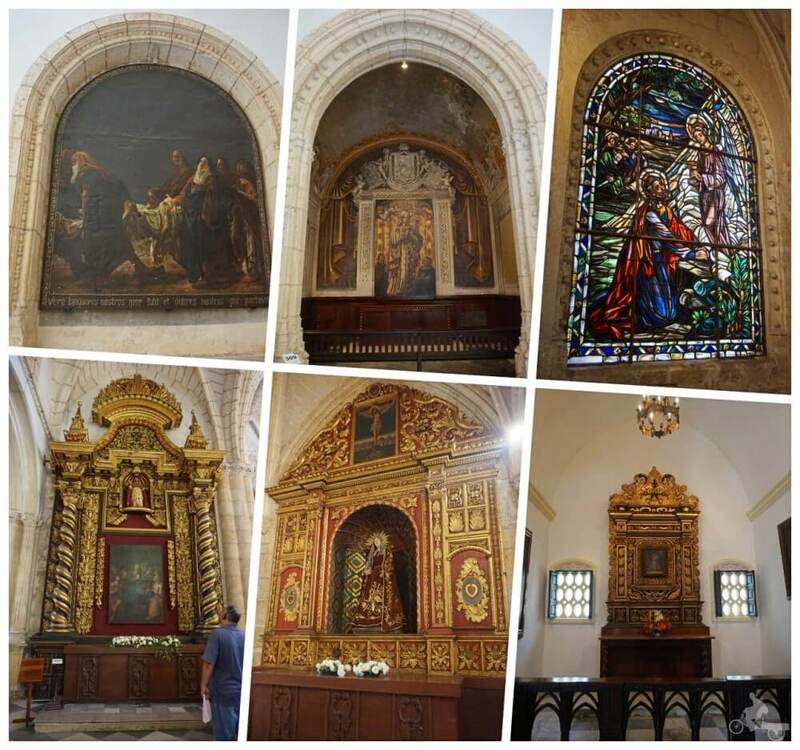 The cathedral contains a vast artistic treasure consisting of altarpieces, paintings (including a panel of the Virgin of Altagracia, dated in 1523), antique cabinetmaking, furniture, monuments and tombstones, among other objects. 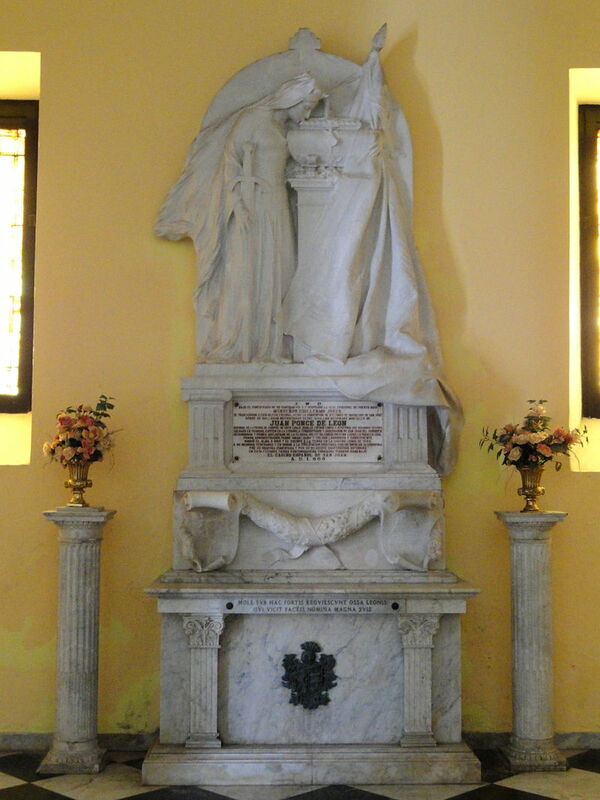 The mausoleums of the archbishops of the colonial period stand out, also it is necessary to mention the tombstone of Simón Bolívar, one of the predecessors of the Liberator. In the cathedral the remains of Christopher Columbus were sheltered for a time, and they moved to the Columbus Lighthouse. The valuable archbishop’s throne, plateresque style is dated in 1540. 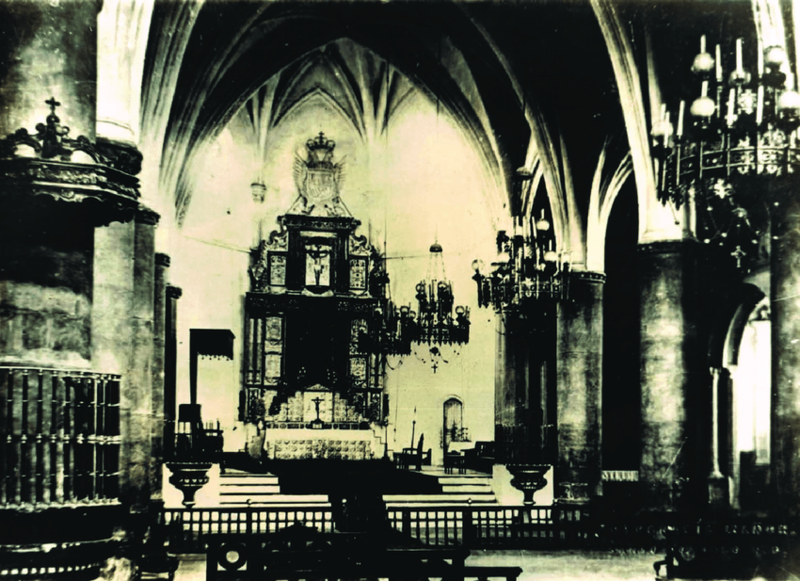 It was part of the low choir, dismantled at the end of the last century to place the marble monument in which the remains of Christopher Columbus were kept. Tomb of Christopher Columbus before his transfer to the Columbus Lighthouse in 1992. The Cathedral is built with calcareous stone, although some walls are masonry and bricks, and has twelve side chapels, three free ships and a main nave. The roof of the central nave is gabled. Those of the lateral naves are constituted by vaults of crucería that accuse to the outside, as if they were semispherical cupolas. The largest length of the basilica is 54 m in the central nave to the bottom of the presbytery. The width of the three naves is 23 m. The highest floor to ceiling height reaches 16 meters, and the constructed area exceeds 3,000 square meters. Fourteen side chapels were built throughout the history of the cathedral. The environment of the cathedral is formulated in three independent spaces, to the north the Plaza de Armas, the crenellated atrium is like an anteroom that marks the main entrance to the religious complex. To the south the claustra called Plazoleta de los Curas. The annexes around the patio allow a passage called Callejón de Curas. 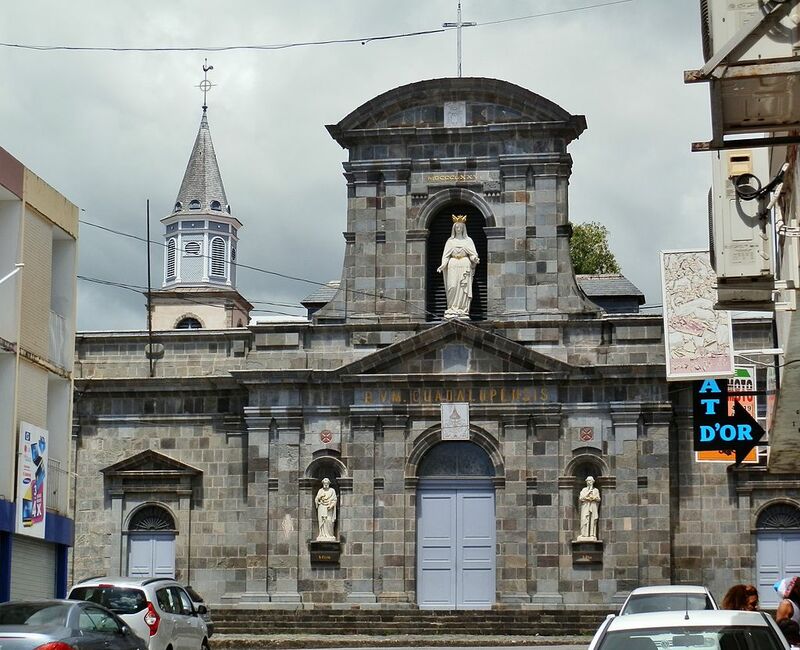 The steady influx of Portuguese migrants from the island of Madeira from 1835 onwards strengthened the growth of the Roman Catholic community. The foundation of the basilica is on the site of a rural chapel built by a Catalan estate owner called Don Gerardo González, who was the owner of the valleys of the region. Although the specific date when the original chapel was constructed is not known, some records date it as far as 1590. Also, radiocarbon dating tests done to pieces of wood from a coffin found in the basilica point to the existence of the chapel as far back as 1570. The structure combines romantic elements and styles in its architecture, including a bell tower with Mozarabic elements. In 1696, the chapel acquired a guest house called Casa de Peligrinos (Pilgrims House). In 1814, Juan Alejo de Arizmendi, the first native Puerto Rican bishop, fell ill in this house after traveling around the island in his second pastoral visit. He desired to be buried in his beloved chapel. He died in Arecibo the following October 12, but his wishes were not followed, burial instead taking place in his catedral. The house is now the rectory of the basilica. The basilica and its rectory were listed on the National Register of Historic Places in 1975 as the Santuario de la Monserate de Hormigueros and Casa de Peregrinos. 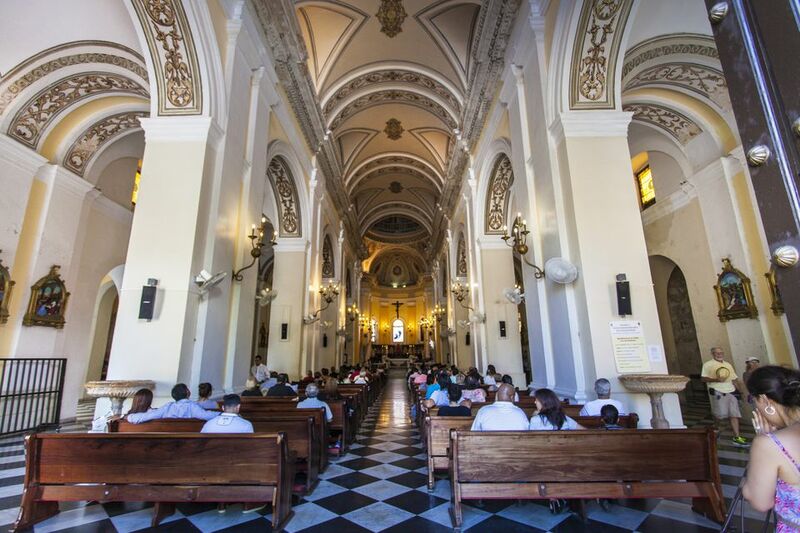 The cathedral is one of the oldest buildings in San Juan, located in Old San Juan, the oldest cathedral in the United States, and is the second oldest cathedral in the Americas. 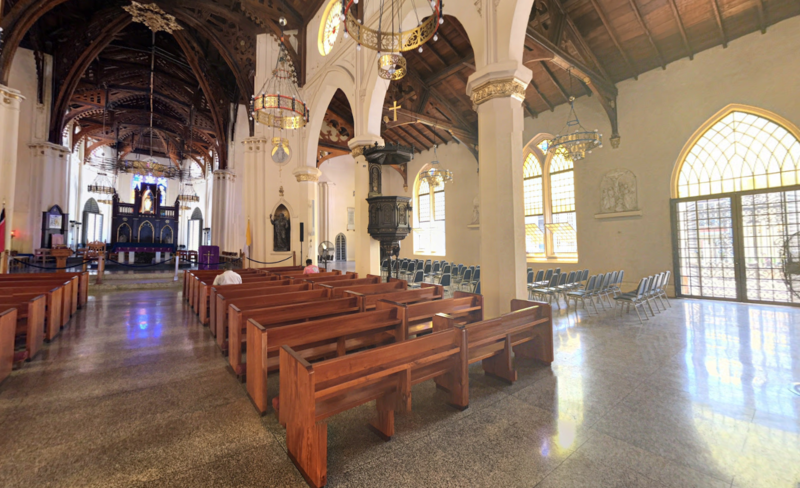 Even though the Cathedral of Santa María la Menor in Santo Domingo in the Dominican Republic, is an older church building, the Cathedral of San Juan Bautista was the first cathedral church in the Americas as San Juan, then known as the city of Puerto Rico, was the first diocese of the New World with bishop Don Alonso Manso in 1511. 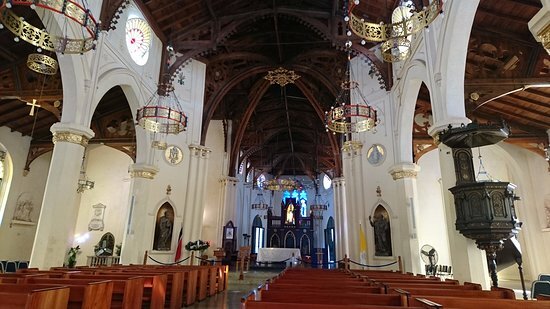 The original cathedral in what was the city of Puerto Rico (changed to San Juan Bautista in 1521) was constructed from wood in 1521. It was destroyed by a hurricane and the current structure constructed in 1540, being reshaped in later centuries, the last time being in 1917. The first school in Puerto Rico was the Escuela de gramática (Grammar School). The school was established by Bishop Alonso Manso in 1513, in the area where the cathedral would later be constructed. The school was free of charge and the courses taught were Latin language, literature, history, science, art, philosophy and theology. 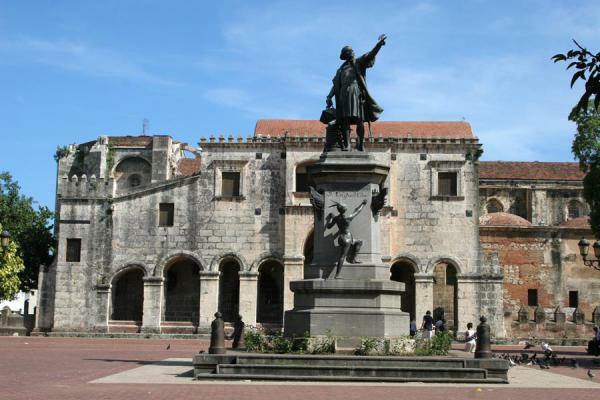 The cathedral contains the tomb of the Spanish explorer and settlement founder Juan Ponce de León. 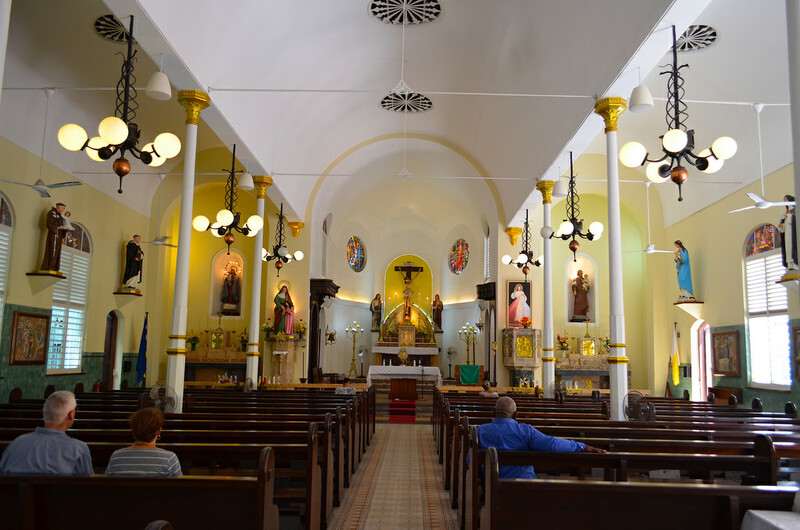 It also has a shrine to the Blessed Carlos Manuel Rodríguez Santiago, the first Puerto Rican, the first Caribbean-born layperson in history to be beatified. The cathedral is named after Mary, mother of Jesus, under her title, Our Lady of the Immaculate Conception. 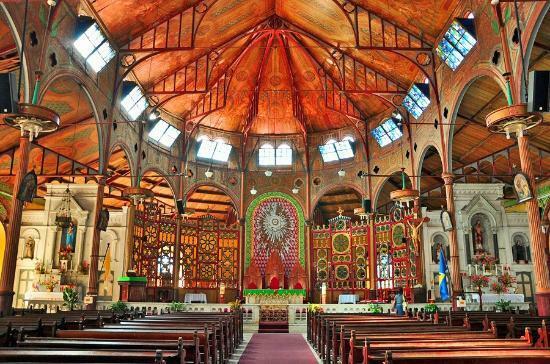 The form “Cathedral”, as it is commonly known, is the largest church in the Caribbean, measuring 200 ft long (61 m) by 100 ft wide (30 m) and was given the honorary status of a Minor Basilica on 11 May 1999 as part of the centenary celebrations. Construction started in 1816 and it was completed in 1851. 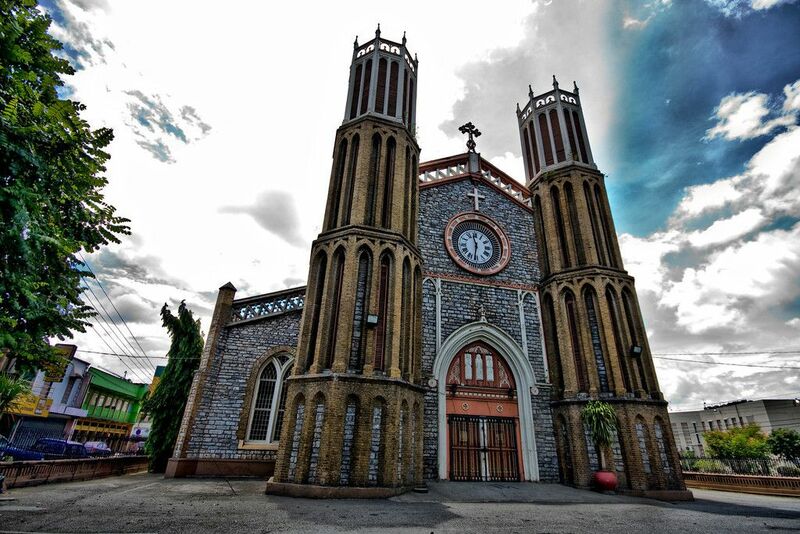 The same year the cathedral was given the honorary status of a Minor Basilica. 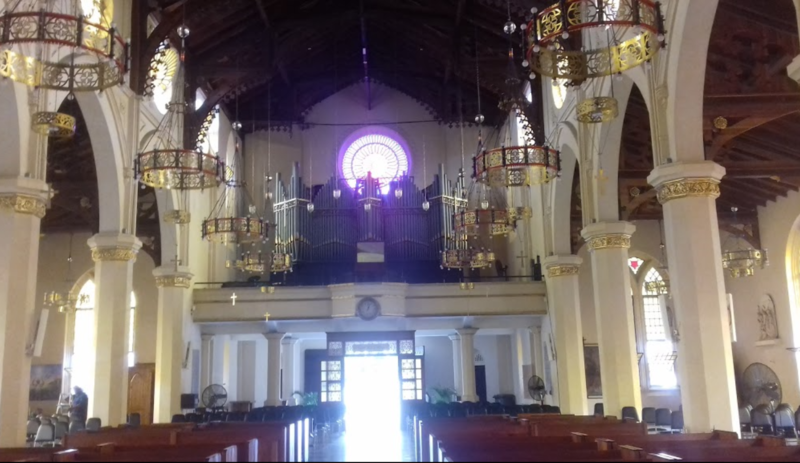 The first Catholic Church in Port of Spain was built in 1781 by the Spanish governor Martin de Salverria on the site that is now known as Tamarind Square. The English governor Sir Ralph Woodford decided to build a church better suited to the growing and predominantly Catholic population. Plans were drawn by the governor’s secretary, Phillip Renagle, and the foundation stone was laid on 24 March 1816. 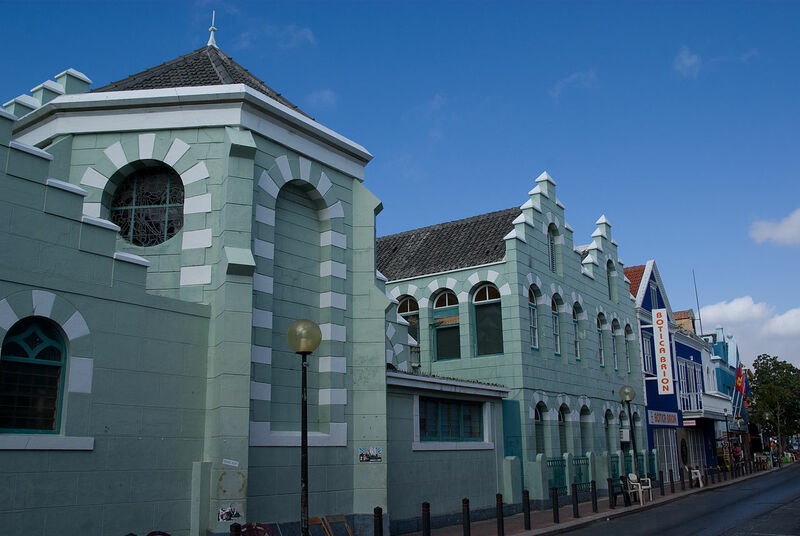 The new church was located west of the existing church at the eastern end of what was MARINE Square, one Independence Square. 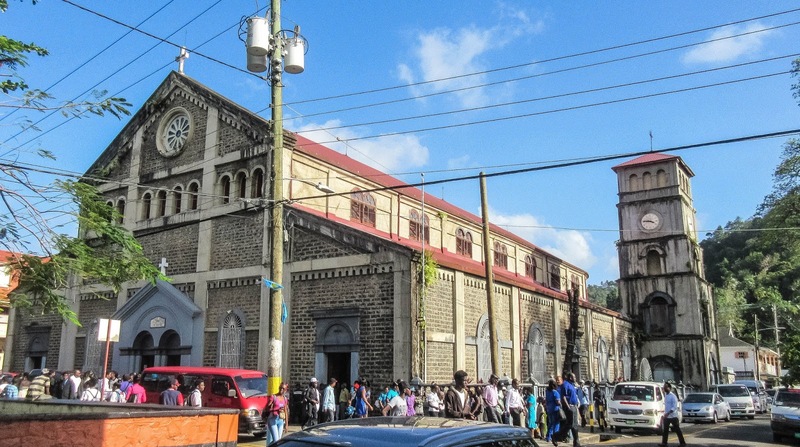 The building was laid out in the shape of a Latin cross and built of blue metal from the Laventille quarries, with iron framework from England for the doors and windows. 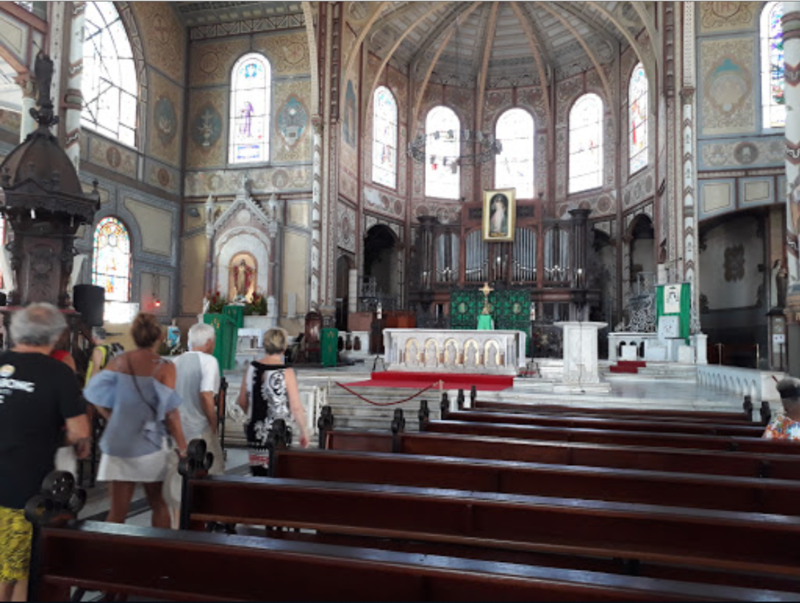 Dr James Buckley, Vicar Apostolic to the Holy See, arrived in Trinidad in March 1820 and the church became a Cathedral. Completed in 1832, the Cathedral would be consecrated in 1849 after all the debts had been paid. In 1851 Pope Pius IX declared that the cathedral was to rank as a Minor Basilica.